Weddings Costs > How Much Does Wedding Dress Cleaning Cost? How Much Does Wedding Dress Cleaning Cost? 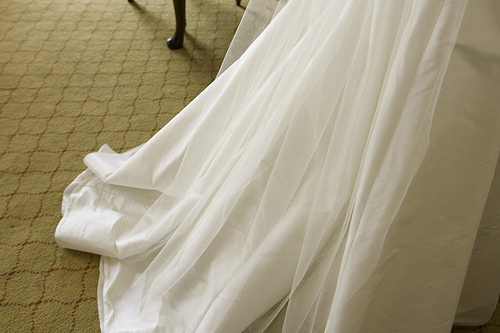 Cleaning a wedding dress is similar to cleaning normal clothing; however, additional care is required due to the nature of the fabric used when making the dress. The wedding dress is one of the many items used during a wedding that is considered a treasure by the couple, and some people wonder what to do with the wedding dress after the wedding. Some may sell their dress, while others may store it, but before they do so, they will have it professionally cleaned. The cost of cleaning a wedding dress depends on the material it’s made from, where you live and the cleaner. How much does a wedding dress cleaning cost? On average, a professional wedding dress cleaning can vary anywhere from $85 locally to as much as $250 if you were to use an online service. Most dry cleaners and online preservation companies will charge a flat rate, and if any additional costs were involved, then it could be due to a stubborn stain such as grass or dirt. If you were to want the dress cleaned and preserved, then the costs could be closer to $500 to $750, again, depending on the company, the insurance involved, accessories and how you want the dress preserved. For instance, AffordablePreservation.com proclaims if the dress were to be preserved in a quality acid-free chest, then you should expect to pay around $200 to $600. For a premium service, then the costs could inch closer to $1,000. For example, Bridal Kare International, a company that offers wedding dress cleaning and preservation, charges $129, plus a $18 shipping fee. Forum members on WeddingBee.com said they had paid anywhere from $150 to $200 to have their wedding dress dry cleaned and preserved inside a window box. According to EverAfterGuide.net, you should expect to pay around $100 if you were to use a higher-end company, but this for a basic cleaning. The website claims if you were to have oil stains or it’s overly elaborate, then the costs could be more than $200. When it comes to cleaning your wedding dress, you will have a few options: For starters, you can store your dress until you’re ready to clean it, attempt to clean it on your own following a DIY method, take it to a local dry cleaner or use an online wedding dress preservation company. The best time, regardless of which option you choose, is right after your wedding day. This way, you risk the chance of staining or ruining it in storage. Using an online preservation company, for instance, will require you to ship the wedding dress in a shipping box provided by the company. Your gown will then be shipped to the facility, cleaned and shipped back in a preservation box, allowing you to store it where you wish. Dry cleaning, depending on the method you choose, can take anywhere from a few days if you were to use a local dry cleaner to as long as 30 days if you were to ship it to an online company. The time can also depend on the layers in the dress, how busy the dry cleaner is and if shipping is involved. If choosing a local dry cleaner, the following solvents may be used to clean it: Greenearth, Exxon DF-2000, a Stoddard solvent or Perchloroethylene. Greenearth, for instance, is a solvent is silicone based and is ideal for beaded dresses; however, it won’t be as good when removing stains. Exxon DF-2000 is petroleum-based and is excellent at treating beads and sequins. Similar to Greenearth, this cleaner is the number one choice by experts and dry cleaners across the United States. A Stoddard solvent, which is similar to Exxon DF-2000, is also petroleum-based, but unlike Exxon, it’s not used as much anymore. Due to strip malls and fire codes restricting this cleaner, many professionals opt for the safer alternatives. Lastly, Perchloroethylene is the most common stain remover at most dry cleaners. This solvent is ideal for degreasing, and if the dress is made from silk, rayon or acetate, there’s a good chance the cleaner will use this to remove stubborn stains. Because of the environmental impacts, your local state laws will dictate which solvents can be used. The shipping costs may not be included in the estimates included above. If not, these shipping fees can be anywhere between $15 and $45. Adding additional keepsakes from your wedding day, such as the veil, shoes and purse, for instance, can be preserved for an additional fee. Some, however, may include this free of charge, so it’s best to check the contract ahead of time to see what’s included. If not, plan on paying an additional $20 to $50 per item. Dry cleaners will often bag your wedding dress after the procedure but may be able to upgrade to a window/shadow acid-free box for an additional $25 to $75. Adding a touch of personalization, such as adding a picture or date to your box, could increase the cost. Personalizing often increases the price by $25 to $50, depending on the complexity. While it may be tempting to clean the dress on your own, it’s important to know that silk and other sensitive materials won’t respond well to the over-the-counter laundry detergent you probably use. If you fail to clean the dress properly, according to WeddingGownPreservationKit.com, you can damage the delicate material. Another material such as polyester organza should be used with caution as well as this material can lose its “crispiness” when hand pressing the material. Bleach, one of the harshest chemicals we know, should never be used on a dress in any circumstances. When choosing a local dry cleaner, ask them how the dry cleaning will be performed. Some dry cleaners will be able to perform the cleaning on site, while others may ship it off to a third-party vendor since most local companies won’t have the right equipment to perform the job properly. If they do ship it off to another company, then it’s best to skip the dry cleaner and find a similar company to save on the markup costs. Always ask about the warranty before you pay your invoice. If a dry cleaner stands behind their work, then they will be more than happy to offer a warranty, usually 90 days to one year long. For the best results, Heritage Gown recommends a dry cleaner that uses a virgin solvent. This type of solvent won’t be recycled like other solvents, causing that dry cleaning smell. Carefully read the label on the dress to make sure the right chemicals are used; for example, some gowns will state dry clean only with petroleum-based solvent. As mentioned above, Exxon DF 200 and Stoddard will be petroleum based. Shop around if you’re going to use an online service or even a local dry cleaner. You’re going to find that some may vary by as much as a hundred dollars, even if they use the same exact service.